"Identity is a huge part. You start sport young and it becomes intertwined with who you are for so long. Then overnight it's gone." Some of Australia's sporting greats have shed light on the mental health issues that come with retirement. A cast of former elite Australian athletes have openly admitted to struggling with mental health issues, addiction and coming to terms with their identities after retiring from the sports in which they became champions. 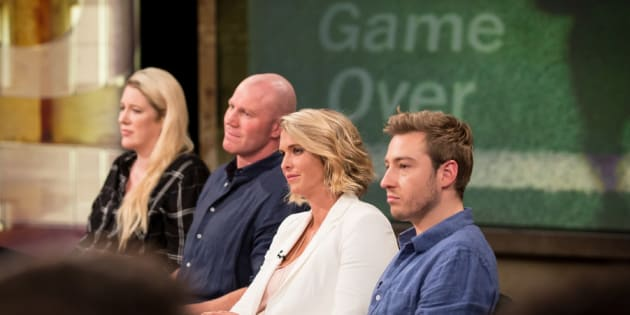 Appearing on the first instalment of a two-part edition of SBS' Insight, ex-Sydney Swans captain Barry Hall and former Olympians Lauren Jackson, Libby Trickett, Matthew Mitcham and Jana Pittman all detailed the difficulties they experienced with understanding who they were without sport. AFL star Barry Hall retired in 2011, ending his career with the Western Bulldogs after a seven-year stint with the Sydney Swans, and said he struggled mentally with the lack of routine that comes with the life of an ex-athlete in retirement. "I chose to retire, I wanted to retire. I got the feeling that when I went to training every day that I didn't want to train anymore," he said. "I didn't want to prepare to the best of my ability to perform on the weekend. I think at that stage that's the time to give up the game. Did I struggle after the sport finished? Absolutely. "I had two or three months... that I really struggled. I didn't get out of bed. I didn't answer mates' phone calls, I was eating terribly, drinking heavily. A tough time. And look, I didn't know at that stage it was a form of depression." Basketball great Lauren Jackson, who announced her retirement in 2016 after a spate of injuries, said she needed a doctor to tell her directly that her career was over and found it "really difficult" leave the game. "I was pushed out because of injury, obviously. And I personally wasn't ready to retire. It was one of those things where I couldn't run any more and, there was no way I could get back out on to a court," she said. "A group of doctors said, you will never play again, it's over. That was it. And I just remember thinking, OK. So I got out of the room and, yeah, I broke down and it was hard. I mean, it was really difficult." Jackson also said she "went into a shell" after retiring, relying on the care of her parents before falling pregnant and moving on. "I went into a shell. I stayed with my parents. I didn't leave the house. They really just took care of me," she said. "I really don't want to go into great detail about how hard it was, because it was really, really difficult." She also admitted the sudden change in people's attitudes towards her while moving from being an elite athlete one day to a retired sports star the next took a toll on her, saying it felt like she had been "put out to pasture". "I think for me when I retired, it's really interesting, it felt like I was put out to pasture, literally," she said. "It was like, I'd been one of [her coaches'] greatest resources and athletes and all of a sudden it was over. You don't hear from them. You know, meanwhile my body is crap." For former Olympic swimmer Libby Trickett, who retired in 2009 and again in 2013, said her struggles with depression came from being unable to come to terms with her identity post-sport and finding another passion during retirement. "When you are training 35 hours a week you can eat a lot. When you're not training 35 hours a week, I could eat like I was training at that Olympic level. I put on a lot of weight, had no routine, stopped all forms of exercise," she said. "I stopped wanting to catch up with friends and family. What do you talk about now? You know? "I had nothing outside of swimming, really. You know, I tried to create something outside of swimming, so I was doing university, but it wasn't necessarily a passion." Former Olympic diver Matthew Mitcham, who retired indefinitely in 2016 at age 27 and has been open in the past about his battles with depression and drug addiction, said he saw his mental health issues as a "weakness" throughout his sporting career that ultimately led to his exit from sport. "Because I suffered from a pretty profound period of depression from 14 to 18 and because of the nature of sport -- well, also because of my own faulty beliefs around my mental health -- I didn't want to tell anybody about it because I saw it as a weak," he said. "I didn't want anyone else to see that I had a weakness and exploit that, so I tried to manage it myself, which ended up resulting in me retiring at 18 and going a bit off the rails with drugs and partying and stuff." Mitcham said after winning a gold medal at the 2008 Beijing Olympic Games, he started to believe the network of people he had around him were only there for the allure of sporting success, and not for him as a person. "After a while the self-esteem stuff started to kick back in again and I started to believe that nobody actually liked me," he said. "They just liked the medal and I was just a coat rack for the medal and and that I had no value as a person. That's when I had a relapse of my drug addiction." While athlete Jana Pittman is yet to officially retire, she told Insight she believes she's currently going through the emotions described by the other cast members, saying it's the "hardest thing I've ever dealt with." Pittman welcomed her third baby in February but says she still finds it difficult to think about letting go of elite competition. "I don't know if I've really retired yet. Whereas these guys have had it a bit differently. Listening to how you talk, I'm not sure I've coped with it yet," she said. "I think it's probably the hardest thing I've ever dealt with. Whereas these guys have succeeded, I never hit the goal I was hoping for my career, so growing up as a child wanting to win the Olympic Games is all I dreamed of. "I have a beautiful family, three beautiful kids, studying to be a doctor, so many things [that] I can't fit training in any more. Like Barry, I'm not interested in being there, but for some reason I can't let go, because that elusive gold medal never happened. My poor family, I'm retired, then five minutes later I'm back at the gym." For Pittman, the shift in identity from that of a sporting star to uncertainty is the main reason athletes find it so hard to cope with retirement. "It's that you have caught yourself up so much in what you want and believe is who you are," she said. "A part of my lack of retirement issues was trying to prove to other people that I am a good athlete, I am worth who I am and it took a long time, probably getting into medical school, before I realised I'm OK as I am." In a 2015 study of 224 elite athletes who had already retired, it was revealed depression, eating disorders, and general psychological distress were the most common mental health issues experienced by former sporting stars, according to the SBS. Without a clear pathway of support for most athletes throughout retirement, issues were found to have risen in relation to the change in lifestyle.